Portland's giant marching band invites adults to join and march "one more time"
PORTLAND, OR, February 8, 2010  A new season is about to begin for the 500-member One More Time Around Again Marching Band (OMTAAMB), and the directors want to remind former high school band members that you're never too old to rock and roll ... it just takes more ibuprofen to recover. With members ranging in age from 18 to 90, the OMTAAMB invites you to join what co-director Jay Bengel calls "the best kept secret" in the marching band world for adults. Although the majority of members come from Oregon and Washington, Bengel says members have come from all across the United States and countries such as Japan and New Zealand. "If you loved marching band and wish you had the chance to do it again, don't pass this opportunity," Bengel said. "It truly is an amazing happening." In parade formation the 500-piece marching band stretches over three city blocks. 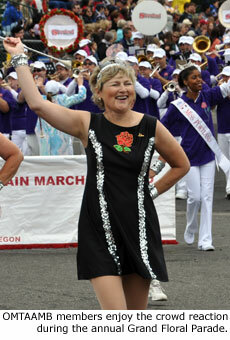 Its annual performance during the Portland Rose Festival Grand Floral Parade draws a rousing reaction from the crowd. "We play to a four-mile standing ovation from half a million people," Bengel said. "It doesn't get much better than that." The One More Time Around Again Marching Band also makes other appearances during the Rose Festival. At the nighttime Starlight Parade the band plays to an audience of 200,000 to 300,000 people along a route of 2.5 miles. A standstill concert at the Waterfront Village gives the band a chance to show its high level of musicianship and talent. The key performance dates for 2010 are Saturday, June 5 (standstill concert and Starlight Parade) and Saturday, June 12 (Grand Floral Parade). Music will be available to members beginning March 13 so they have time to practice before official rehearsals are held in April and May. 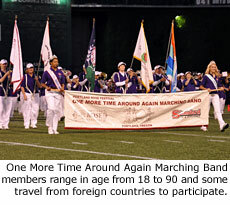 Prospective members are encouraged to complete the new member application on the band's website at www.omtaamb.org. The OMTAAMB formed in 1985 with 85 charter members, many of whom were on hand to help celebrate the band's 25th anniversary in the spring of 2009. The band has become an icon of Portland's Rose Festival and it is believed to be the world's largest permanent all-adult marching band. The band now draws musicians who formerly played with high school, college, military and community bands. The band also marches with a large color guard. Band directors Mary & Jay Bengel have a combined 47 years of staff leadership and experience with the OMTAAMB. By profession Mary is an award-winning music educator and conductor, and she also has a performance background. Jay has professional music experience in both performance and production. Another 14 staff members help with instructional and logistical duties. The band achieved a milestone in November 2009 when it became an independent, non-profit organization. 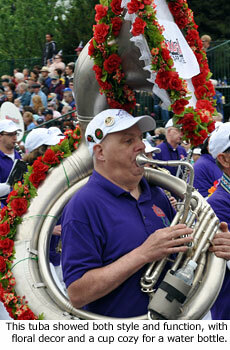 It had previously operated as an arm of the Rose Festival Association. The band is seeking sponsorships and individual donations to help outfit and move the group, because expenses are more than the $50 annual membership fee covers. Although the band most often performs in its home territory in conjunction with the Portland Rose Festival, the OMTAAMB has taken its show on the road to other major festivals. The band performed in the 1990 Tournament of Roses Parade in Pasadena, California and also appeared at Disneyland during that trip. The band has traveled to the Seafair in Seattle, Washington; the Festival of States in St. Petersburg, Florida; and twice to the Fiesta Flambeau Parade in San Antonio, Texas. The band also made a halftime appearance at an Oregon State University football game. Whether performing at home or out of town, the massive OMTAAMB is a favorite story among the media. The band has received local and national television coverage through its appearances in the Grand Floral Parade, and the band has been featured by the CBS Morning show, the New York Times and the Wall Street Journal. The band was the subject of a four-page feature article in Open Spaces Magazine under the heading "Northwest Traditions." "Portland is one of the most beautiful and friendly cities to visit," Bengel said. "And the band is more fun than you ever remember marching band to be." For more information or to download an application, visit www.omtaamb.org. You may also send email to the directors. The OMTAAMB's mission statement reads: The One More Time Around Again Marching Band is organized and operated exclusively for charitable and educational purposes, including the encouragement, enhancement, education and development of musical abilities. In addition, it will provide opportunities for talented individuals to demonstrate their musical and performance abilities in concerts, small group performances and community parades. The band endeavors to provide musicians with an avenue to continue their lifetime experience with music, while supporting the community in which we live and perform and promoting a "never stop learning" mindset in young and old alike by encouraging a multi-generation awareness of music. Source material courtesy of One More Time Around Again Marching Band. Photos by Marching.com.